We are excited to announce that artist Richard Shorty has kindly created a Red Ribbon Image for the Immunodeficiency Clinic (IDC) at St. Paul’s Hospital. Richard Shorty was born in Southern Tutchone (Tshimsian) in Whitehorse. 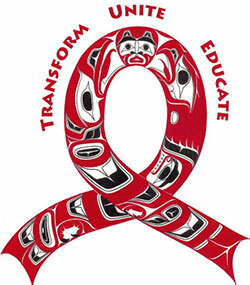 He is a self-taught West Coast designer who is very aware of the effects of HIV/AIDS within Urban and Remote First Nations Communities. The image contains the Raven which symbolizes transformation, creation, and adaptability. In the middle of the image Human beings are being empowered to transform, create, and educate. Finally; the Eagle represents the power balance and prayers we need to carry out our mission. We hope that this image will continue to be used as a source of inspiration in all the things we do.